Using urxvt already. Sorry I forgot to mention that. First off, sorry about the double post. Setting the default-terminal in tmux.conf should not be necessary. Setting the TERM environment variable in your bashrc is likely the cause of your problems. Remove that. Urxvt should automatically set TERM to rxvt-unicode-256color. That's what solarized dark looks like with set t_Co=256. I don't use the Solarized colorscheme or the CSApprox Vim plugin. But at this point, if I were you, I'd go with what works. Thanks! Worked well for me. Four colors are swapped for me, but everything seems OK in my daily use. I think that's because other configuration, like .Xresources, are set accordingly. However, I checked Ethan's values  and the first post in this thread (very helpful - thanks @drm00!) seems to be the one that swapped the colors. In Ethan's values, 0 is black, 8 is bright black, 7 is white and 15, bright white. These four values match my screenshot, but black is swapped with white in the first post, with the rest being exactly the same. By the way, I managed to get the bold 0-7 colors right in tmux by exporting TERM as xterm-256color and aliasing tmux to "tmux -2". Thanks for the advice. I set some configuration long ago and double checked them now. Actually, my gnome-terminal's TERM is xterm-256color by default and I have the default-terminal in tmux.conf set as screen-256color. 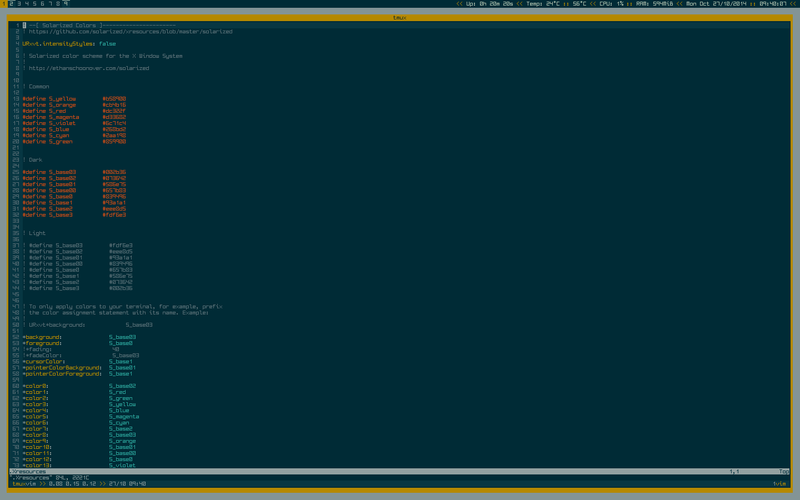 However, the simpler script only shows the same colors when starting tmux with the -2 option. Otherwise, bold 0-7 looks like 8-15.